NASA astronaut and One-Year crew member Scott Kelly gathered hardware today for the start of the Fluid Shifts experiment. For the experiment on Tuesday, both Kelly and Russian cosmonaut Mikhail Kornienko will don the Russian Lower Body Negative Pressure (Chibis) suit and undergo ultrasound measurements. Fluid Shifts is a joint NASA-Russian experiment that investigates the causes for physical changes to astronaut’s eyes. Results from this study may help to develop preventative measures against lasting changes in vision and eye damage. Meanwhile, NASA astronaut Terry Virts worked today to prepare the Multi-Purpose Small Payload Rack (MSPR) and Thermal Container to enable the ground to perform additional data collection in advance of the Cell Mechanosensing-3 experiment, launching on SpaceX-7. ESA astronaut Samantha Cristoforetti took samples for the Microbiome experiment which investigates the impact of space travel on both the human immune system and an individual’s microbiome, the collection of microbes that live in and on the human body at any given time. 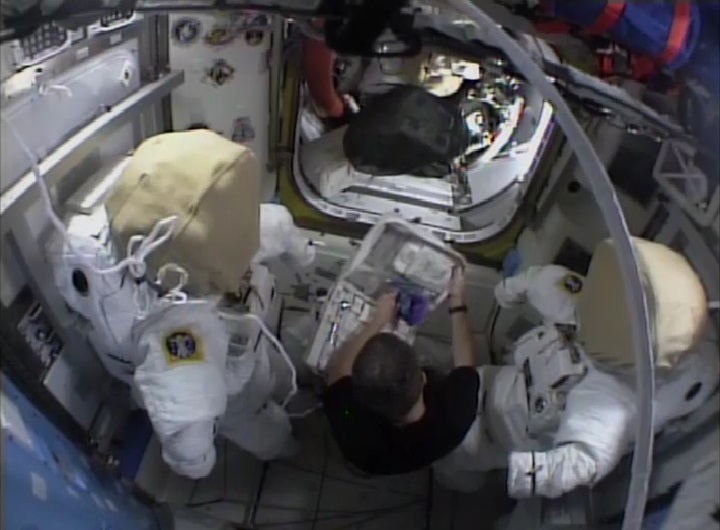 Virts and Cristoforetti also gathered tools inside the station’s Quest airlock for upcoming work on one of the U.S. segment’s spacesuits. Today, the Russian Federal Space Agency (Roscosmos) announced they will provide an updated vehicle launch and landing schedule by June 9.